How long have you been working for Jenny Moore? I started working for Jenny in the fall of 2000. You work as her bodyguard? 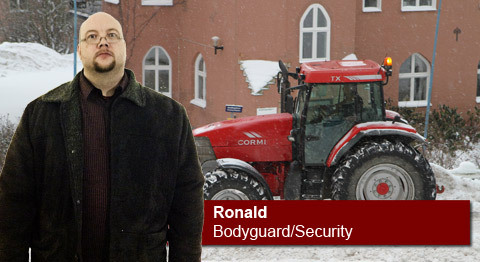 Well, when I first started I was hired as a bodyguard, and I was the only one who took care of her security. Usually I only worked a couple of days a week. But in recent years, after her career really took off, there was more work. Now we are five people who take care of security, but I have the overall responsibility. Speaking of security, her house was very highly monitored. Had she been threatened? Jenny Moore constantly received threats. Two years ago she received nearly 2000 death threats in just a month because she had worn fur to an event. She also used to get at least 2-3 threats a month from women who were convinced she had had affairs with their husbands. Were there any threats that stood out? No…or yes, lately there have been a few letters from a Christian lunatic who was not especially happy that Jenny was involved with the Supertologi Church. The letters were pretty nasty and unusually specific. Did you increase the level of security because of the threats? No, we always have a high level of security surrounding Jenny. The house had a very advanced security system, but there was a “hole.” Why did you not have any coverage from the gate in the back and into the house? Jenny wanted it that way. We have pointed out that it was not a good solution, but she insisted on having it like that anyway. No, but I guess she wanted the possibility to have visitors without them being caught on camera. Did she have many secret visitors? It’s not something that I have a reason to care about. Jenny is…was…an adult and she saw whoever she wanted. I did the last round at 10pm, after that I went up to the house to find out if she wanted anything else, but she didn’t so I activated the alarm on the main gate and drove home. Did anything unusual happen that night? Yes, that’s his name! He was here and snooped around outside the gate just before I left. It was a little strange, but on the other hand, those things happen more often than you think when Jenny Moore is involved. Is there anyone who can confirm that you left the house just after 10pm? Yes, I went to Jimmy’s Bar after work. I had a few beers and hung out with the guys. I must have arrived at 10:30pm and I stayed for a few hours. So you have no alibi from 12:30am? …no…I went home and to bed after leaving the bar. Is it correct that you also own a snow shoveling business? Yes, I started the company a few years ago. First it was really slow, but this year the business has really taken off.